Mountain Pepper is a handsome evergreen shrub from Tasmania that has gained great popularity in the PNW. 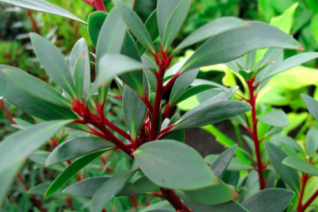 Upright rounded shrub with matte green leaves held on red stems and petioles. Indeed this gives it its other common name of Winter’s Bark. In spring small off white flowers appear in clusters. Good looking year round. Full sun to part shade in rich well drained soil with regular summer moisture. Not drought adapted. Locate away from the focus of subfreezing winds. Moderately fast growing to 6′ tall and 4′ wide in 7 years. Aromatic foliage when bruised.